For almost a decade, Iceland’s Skálmöld has transcended traditional Viking metal through an important lesson in simplicity. With a name translating to “Age of Swords” and “lawlessness,” the troop conveys primal brutality through relentlessly pulsing beats. The upcoming sixth installment in their book of lore Sorgir is an example of a battle cry that doesn’t read too one dimensionally. A colorful use of oboe, traditional Finnish music, and inspiration from the metal greats provides the energy to plow through forest and field. Hearty without becoming overblown, the album becomes the perfect backdrop for Skálmöld’s tradition of storytelling. Yet, there is another story in need of being told — that of their album artist, Kristján Lyngmo. From his home in Reykjavík, Lyngmo has been producing art for nearly 15 years. While he’s worked in broader markets of animation, illustrations, and graphic design, he’s found a niche in helping Icelandic bands bring their visions to life. His path eventually crossed with Skálmöld, merging the gap between artistic realms. To learn more about Lyngmo’s creative process, artistic identity, and stand-out album art, we went straight to the talent himself. If it’s artwork for an album or a lyric video, I read the lyrics/concept of the album and listen to all the songs. That is usually enough to figure out what kind of story needs to be told and what the overall mood is supposed to be in the artwork or video. Then I start researching online for references while I draw up quick sketches/storyboards in my sketchbook. These are usually not very detailed. They’re mostly fast and rough images to figure out a good silhouette for the characters, a good composition, that sort of thing. After that I start working on the images digitally while listening to the album. I find it’s always good to listen to the new songs and also older music by the same bands in order to focus on what I’m doing. I find it really hard to work without music in general. Work in progress ideas and finished artworks are then sent back and forth to the band for feedback and approval until everyone is hopefully happy. How did you end up linking with Skálmöld? I’ve been a fan of theirs ever since they released their first album Baldur. I had listened to all of their previous albums and gone to a bunch of live shows before I ever met any of them. At some point we were introduced, or I was recommended to them by mutual friends and they contacted me to see if I would be interested in doing artwork for their album Vögguvísur Yggdrasils, which was all about the nine worlds of Norse mythology. I was super excited just to be considered and said yes right away. It’s not every day you get a chance to work on a project for one of your all-time favorite bands. What’s your relationship like now? It’s good. I’m still working on a few things for them related to the new album. I’m always happy to work on something new for them because that usually means I get to listen to some brand new Skálmöld songs. And they are really nice so it’s easy to work on projects for them. It doesn’t really feel like work most of the time. If you work by hand, is translating a piece into the digital realm difficult? Most of my work is done digitally. Although I usually do some quick sketches on paper when I’m starting a project to get some ideas and thoughts down real quick that I can reference later on. I remember when I was younger, Viking and folk metal were associated with super zealous bands like Amon Amarth and Finntroll. Since then, it seems like artists have embraced more restraint and minimalism. What’s your approach to turning topics like Vikings, gods, and war into cool, compelling, and digestible pieces of art? 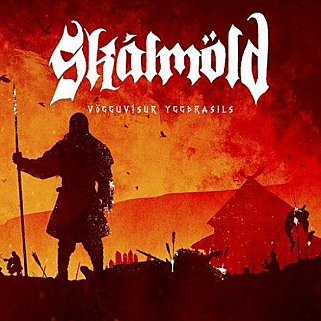 Skálmöld is the only Viking/folk metal band that I listen to on a regular basis. So, I don’t really have much of a comparison to other bands of a similar genre. But I really like their music. I like the stories that their songs tell. They are often super epic and brutal and a bit creepy from time to time so there is a lot of material to think about when I’m trying to draw something new for them. Like most Icelanders I read a lot of the Viking sagas in school as a kid. They are mandatory learning material for everyone who lives here. So, I already knew some of the topics, but I usually have to do quite a bit of research online in order to figure out what some of the characters from Norse mythology are like or what certain things were like back then. But I find all of that very interesting and it’s good to re-learn some stuff while you are working. The main thing though is the music. If I enjoy the music, then all kinds of ideas and images come to mind. But if I didn’t particularly like the music, I think I would have a much harder time coming up with something good to draw. What‘s some of your favorite album art of all time? Personally, I’m a big fan of the System of a Down Hypnotize/Mezmerize (2005) covers. I’m a big fan of Mastodon and I really like all their album artwork. Their music videos are some of my favorites as well. I also dig the artwork from Queens of the Stone Age’s last two albums Villains and …Like Clockwork and their music videos. Alex Grey’s artwork that was used by Tool is also pretty awesome and Tool’s old stop-motion videos are some of my all-time favorites. Sorgir drops on October 12 via Napalm Records. Follow the band on Facebook here.